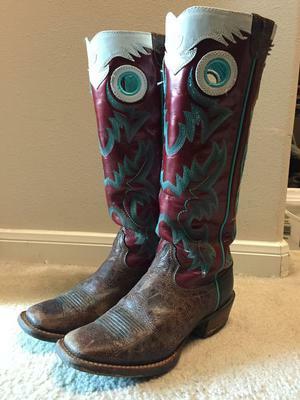 I am selling my Ariat Buckaroo boots. There isn't anything wrong with them, I just have too many boots and am looking to get rid of the ones I don't wear as much. They are a size 6.5, double stitched 15 inch shaft western riding boot. They have slight wear mostly on the toe, but all are minor. I am asking $100, but price is negotiable.